V1.70 Beta 2 is available. Despite being Beta its very stable since it's been around for 2/3 years. with many updates, but also the old Beta 2 Unicode and Non Unicode releases. *Reverted database back to V1.70 Beta 2 seems to be a problem with the installer! Definitely not a fan of the new installer method! They should bring back the .ZIP package. The database has been changed? I had a look at CDEx's forum and found this http://sourceforge.net/projects/cdexos/ ... ic/3459680, seems people are having problems with the new update! Hence why I reverted the entry back to beta 2 after testing. I agree the .ZIP format is much easier than have to Universal Extract. guinness wrote: The database has been changed? I had a look at CDEx's forum and found this http://sourceforge.net/projects/cdexos/ ... ic/3459680, seems people are having problems with the new update! Hence why I reverted the entry back to beta 2 after testing. I agree the .ZIP format is much easier than have to Universal Extract. 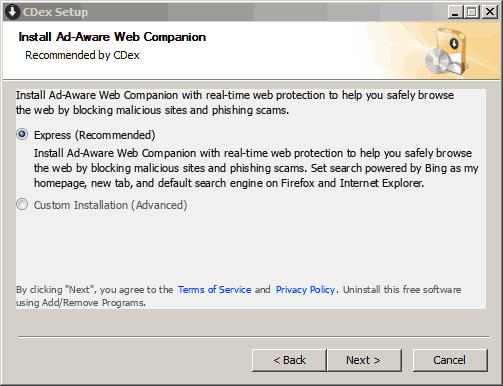 Adding a note about the adware in the install version. This is why devs gotta just post a damn email address. Anyway, my guess is I've gotta switch this over to the PortableApps version (WinPenPack is a little old). Suggestions? webfork wrote: Anyway, my guess is I've gotta switch this over to the PortableApps version (WinPenPack is a little old). Suggestions? Any issues with this path? webfork wrote: I've gotta switch this over to the PortableApps version (WinPenPack is a little old). Suggestions? Well, I think that was plenty of time for public comment so ... done.